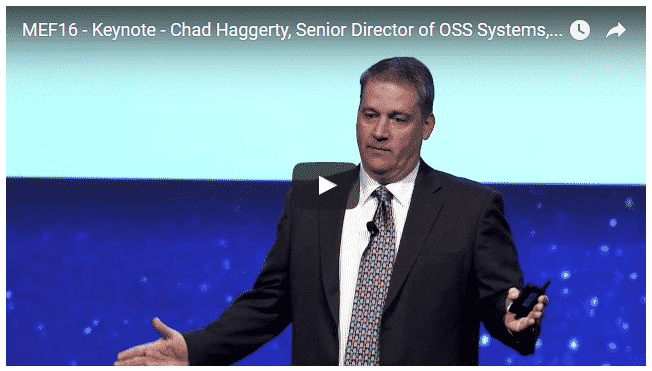 MEF16 Keynote by Chad Haggerty, Senior Director of OSS Systems, Comcast – The digital customer and software-based network technologies require transformative changes to business processes and ecosystems. SDN, NFV, and cloud-based networks enable dynamic, real-time customer-controlled services. Digital customer growth is driving the customer experience deeper into the connected ecosystem. The customer, in effect, is becoming more and more involved in business processes of service providers. Back office systems are being called upon to manage and dynamically control more of the network and to drive more business efficiency and automation in order to handle the scale, increased complexity, and on-demand capabilities. Going forward, back office systems will have more direct customer interactions with a digital economy. A key takeaway quote – “Say goodbye to time” as the expectations of the on-demand customer come into the mix. Providers no longer have the luxury of a long cycle time to update inventories or fix anything that might go wrong. To read the full article, view it on the ThirdNetworkNews website click here.